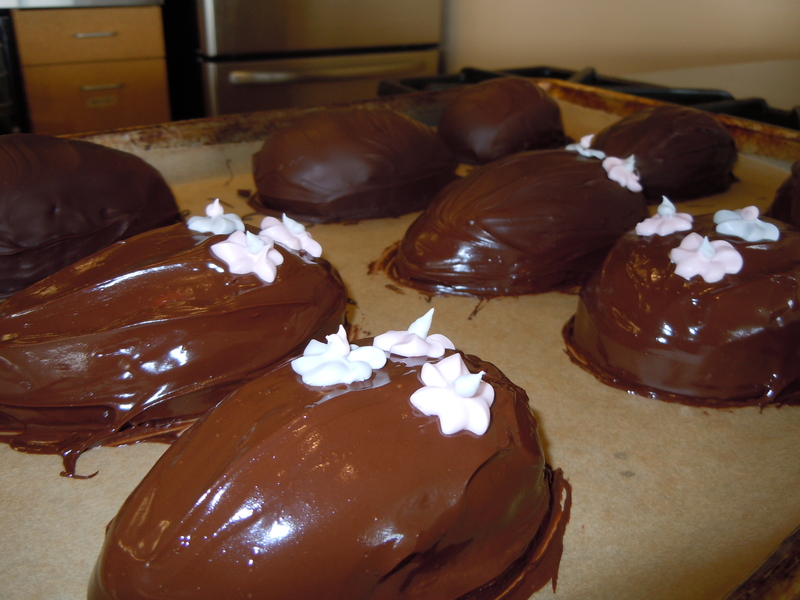 Keeping with my annual tradition of finding a fun and easy recipe for Valentine’s Day, this week I decided to make one of my husband’s favorite treats – peppermint patties. 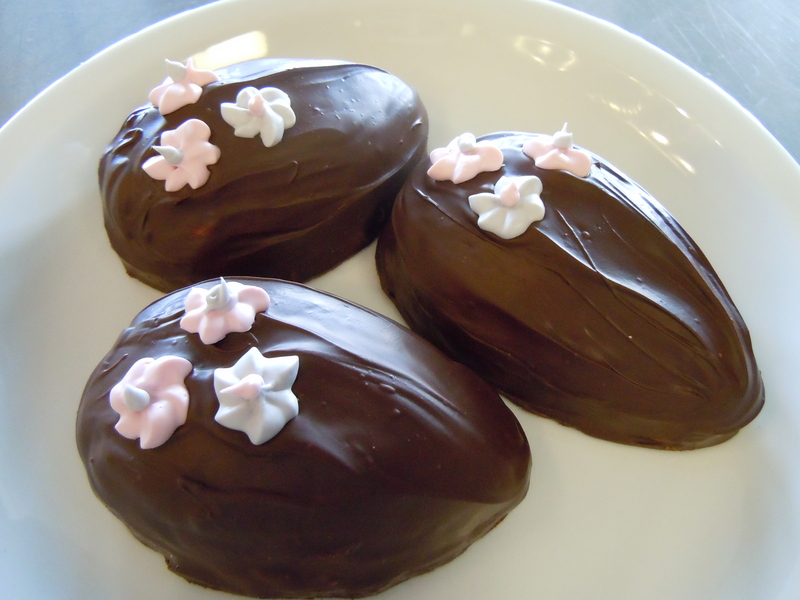 I must say, they were a BIG hit when customers sampled them yesterday and I gave out a record number of recipes! I found a great recipe on Taste of Home that only used five ingredients – sweetened condensed milk, powdered sugar, peppermint flavor, chocolate chips, and some shortening (all of which you can buy organic and trans-fat free at the Co-op). This recipe is fun because you can shape the peppermint dough however you like, something I realized after I had made all my patties for my recipe demo – I’ll pat the dough flat and use a small cookie cutter to shape them as little hearts for the holiday! It also comes together relatively quickly – it took me about 20 minutes to make the dough and shape the patties, plus chill time, and then it took me about 10-15 minutes to coat them with chocolate, plus chill time. One thing I learned from this recipe is that I will always put a little oil in my chocolate from now on if I am using it to cover candies – I’ve always had difficulty with getting a nice even coating of chocolate when I make things like this, and the shortening added to the chocolate in this recipe really makes a difference. If you are averse to vegetable shortening (we carry an organic 100% palm oil version), or just don’t have any on hand, I think that coconut oil would be an acceptable substitute. If you are vegan and are craving some of these homemade candies, I suggest making this coconut version of sweetened condensed milk created by Sunny B on her gluten/dairy-free recipe blog – I think it would work great in this recipe. 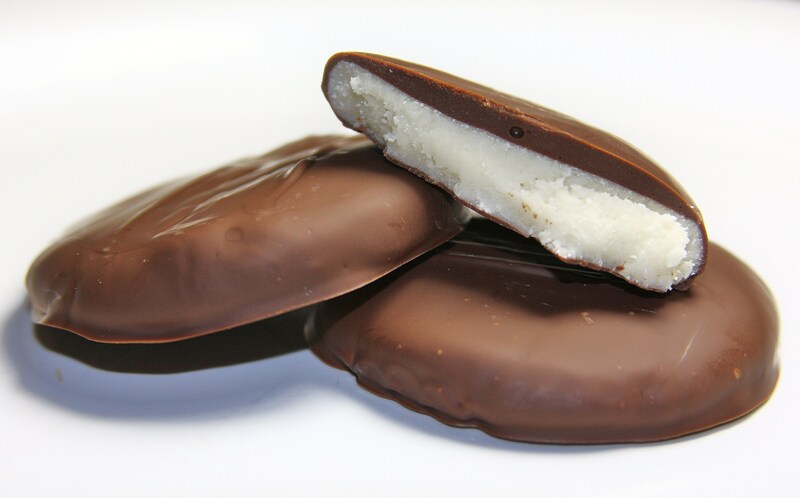 …I’ll also mention that our Bakery has developed a vegan peppermint patty that will be available soon – I got to sample one and they are yummy! In a bowl, combine milk and peppermint flavor. Stir in 3 c powdered sugar, to form a stiff dough. Once you have initially incorporated the sugar into the milk mixture, it is easiest to finish mixing with your hands. Knead enough remaining sugar to form a dough that is very stiff and no longer sticky. 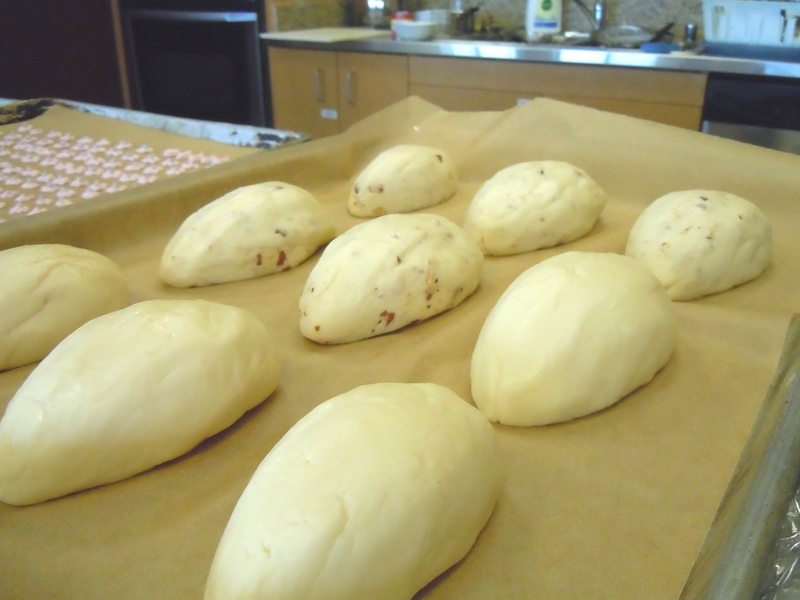 Working quickly, shape into 1” balls (really compact the dough) and place on a waxed paper or parchment lined baking sheet. Flatten balls into 1 1/2” disks.Place cookie sheet in the freezer for half an hour, flipping them after 15 minutes (don’t freeze them for longer than that). Melt the chocolate chips and shortening in a double boiler or in a heatproof bowl over about 1” of boiling water, stirring frequently. The chocolate is easiest to work with when it remains hot, so once the water is boiling and the chocolate has melted, turn off the heat but keep the bowl on the pot to keep the chocolate warm. 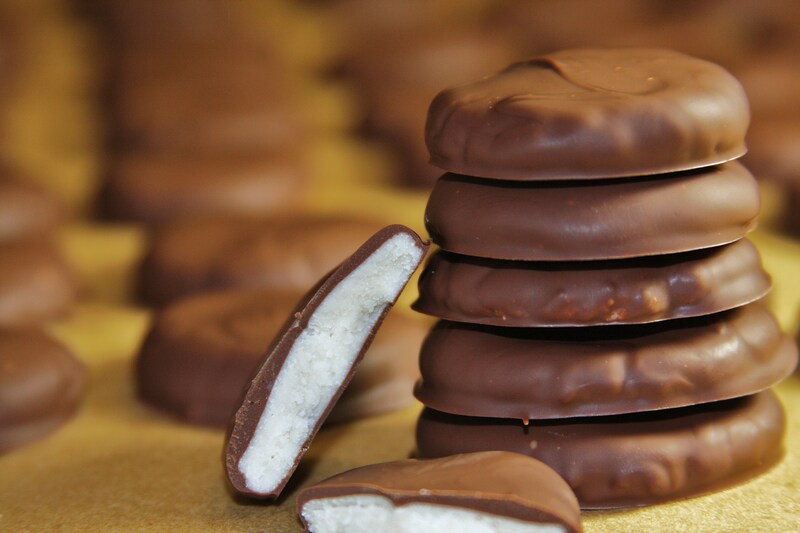 Place a fork under a patty and dip in the chocolate mixture; tap fork against the side of the bowl gently and scrape excess chocolate off the bottom of the patty using the side of the bowl. Place patty on waxed or parchment paper to harden—you can either do that at room temperature or in the fridge. These have a great shelf life—keep them in an airtight container (separate layers with parchment paper) in the fridge for up to a month. Almonds are one of the healthiest “nuts” you can eat (they are related to the peach, and are technically considered a seed). They are high in heart-healthy monounsaturated fats, as well as protein, and they also contain amino acids, manganese, and Vitamin E. The US is the world’s leading almond grower, and essentially 100% of those almonds are grown in California. Commercial versions of almond milk contain preservatives (which I feel affect the flavor), although they also tend to be fortified with calcium and Vitamin D which is a plus. The biggest downside, however, is the sugar that is added to them. Keeping this in mind, I set out to create a simple almond milk recipe that didn’t require any special equipment and didn’t have any added refined sugar. After looking at dozen different recipes/methods, I decided to get into the kitchen and get working! I started by soaking the almonds overnight in the fridge, covered. This is an important part of the process because the soaking really brings out the milky-ness quality of the almonds and also makes them more digestible, resulting in better absorption of nutrients. Another great benefit of soaking almonds (or any nut) is that it removes the tannin from the skin, which gives nuts their bitter flavor. The next morning, I halved and pitted some Medjool dates to use as a sugar alternative, and also set them to soaking (so your blender is able to process them). Once those had soaked for about 45 minutes, I got out the blender and started processing – first a heaping cup of soaked almonds went in, then 2 cups of water. It only took a minute or two for the almonds to grind down, and then I added the dates (tasting the concoction after every two dates to see how the sweetness was progressing). I decided that five was the perfect sweetness – not so sweet that it was overpowering but sweet enough to compliment the amazing almond flavor. You can choose to omit the dates entirely, or add up to seven if you really like the sweetness of commercial almond milk. The nice thing about using dates as the sweetener is that they are also high in fiber and are easily digested. I added the last two cups of water, plus a pinch of Himalayan pink sea salt (my favorite) and I was ready to strain my milk. You can strain the milk in a number of different ways, or if you are going to use the almond milk strictly in smoothies, then you can choose to omit this step (leaving the almond pulp in the milk gives you the full benefits of the almonds and is protein rich). I chose to use a jelly straining bag, as it fit perfectly over the opening of my pitcher and has a super fine weave so I knew that my milk would be very smooth. You can also strain the milk using a nut milk bag or a fine mesh metal strainer (I would suggest putting a few layers of cheesecloth in the strainer – that way as you finish you can gather up the corners and squeeze the last of the milk out of the pulp that is left over. The almond/date pulp that you are left with can be used in many ways, including adding a bit to your morning oatmeal, adding it to smoothies, or dehydrating it and using it as a flour alternative. Success – for about $1.33 a serving I had four cups of the most delicious organic and fresh non-dairy milk I have ever tasted! Soak almonds in fresh water for at least six hours or overnight (if you choose to soak overnight, then cover and refrigerate the almonds). Drain and rinse soaked almonds. Using a blender or Vitamix, add almonds to blender with 2 cups of water. Blend until it is relatively smooth (all the noticeable chunks are gone). Add the sea salt. Add dates and blend to fully combine—3 dates will be slightly sweet and 7 dates will be similar to store-bought almond milk sweetness. Add remaining 2 cups of water and blend to combine (depending on the size of your blender, you may need to hand mix in the remainder of the water). Add vanilla bean seeds or extract if using and blend to combine. Strain mixture into a large bowl or pitcher, either using a metal fine-gauge strainer set over the bowl or a nut milk bag/jelly strainer bag. If using a strainer, I recommend adding a square of folded cheesecloth and straining through that—you can gather up the corners and squeeze out all the milk much more quickly than using just a strainer. If using a strainer and no cheesecloth, use the back of a spoon or rubber spatula to gently push the milk through the strainer (don’t push down too hard or you will get some of the pulp in the milk). Refrigerate for up to 4 days in a covered container. Because this is a raw drink, there may be separation after it sits—just mix and enjoy! Mix a tablespoon or two into your oatmeal/hot cereal. Mix with a little honey or agave and spread it thin on a baking sheet—bake at 350°F until crunchy. Check out Pinterest for more almond pulp ideas! Almond milk is a tasty way to add heart-healthy fats to your diet! Your leftover dates can be used for future batches of almond milk, or can be made into a yummy “caramel” dip…or you can just eat them! I recommend pitting them and then putting a walnut in the center (great suggestion for an appetizer from a customer). The Eat Local BBQ is this Saturday! Readers of my blog know that the Co-op has partnered with Sustainable Connections for the Eat Local First! campaign. Last week we co-sponsored an event with Village Books and Sustainable Connections to benefit the Co-op’s Farm Fund (Frances Moore Lappé, author of Diet for a Small Planet came to town to promote her book EcoMind: Challenging the Way We Think to Create the World We Want with a reception at the Leopold Ballroom) and this week we are having an Eat Local BBQ at the Cordata Co-op. Even if the weather doesn’t fully cooperate, it should still be a really fun event. 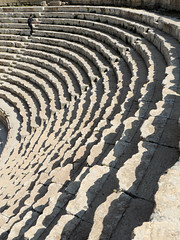 We’ll have beef or veggie kabobs (the grass-fed beef is from Matheson Farms in Bellingham and the veggies are local too! ), grilled local corn on the cob (with flavorful butter choices, also local), local grilled greens or salad, and peach iced tea with Okanogan Farmer’s Co-op peaches. We’ll also have local music, provided by Pretty Little Feet, an acoustic duo that plays old-timey American music and are a lot of fun. There will also be a few local authors at the BBQ sampling recipes from their cookbook or blog. 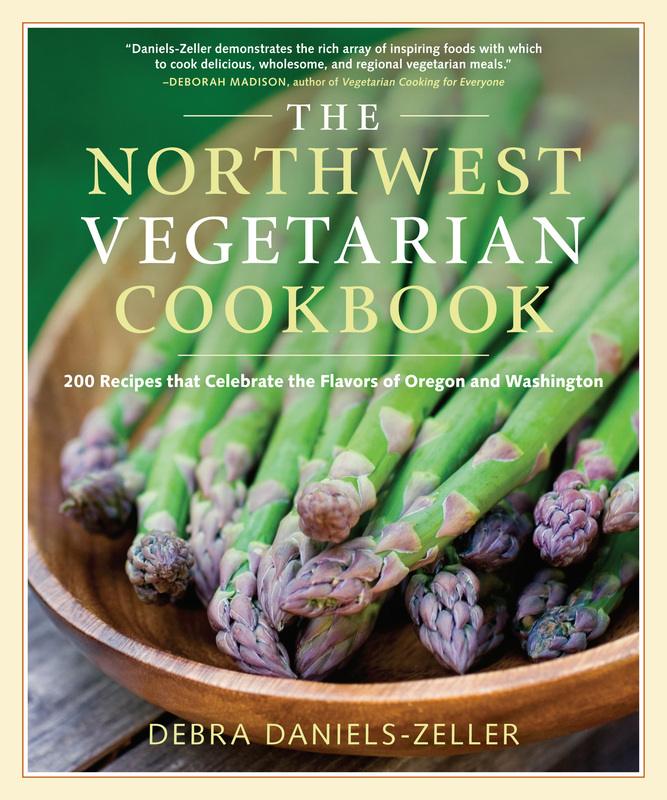 Seattle author Debra Daniels-Zeller will be here sampling a recipe from her book The Northwest Vegetarian Cookbook (she also writes a great blog called Food Connections, and I have blogged about one of her recipes from her cookbook). 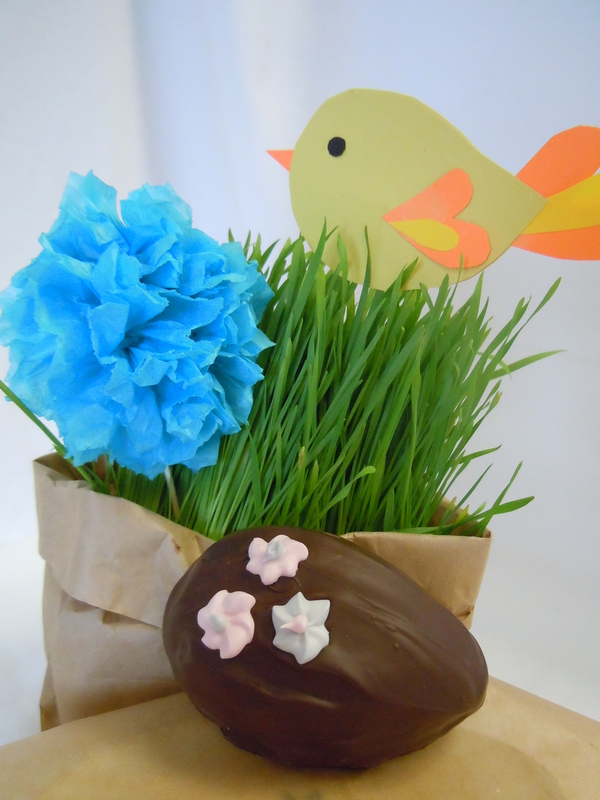 Local blogger Nancy Ging (Whatcom Locavore) will also be here sampling a recipe from her blog. 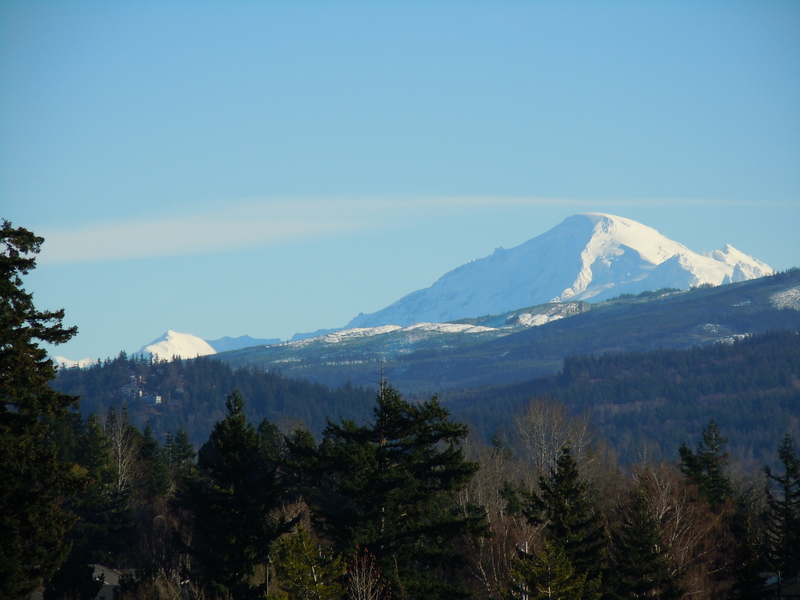 Her blog is a great place to get ideas and recipes for eating local in Whatcom County year-round. 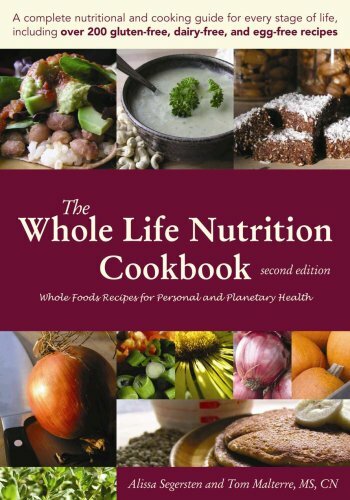 And it wouldn’t be complete without Bellingham author and nutritionist Tom Malterre of The Whole Life Nutrition Cookbook fame. He and his wife Ali collaborated on the cookbook and also write an informative blog with many recipes not found in the cookbook. Jennifer Hahn, local author, blogger and WWU Fairhaven College professor may also be here promoting her book Pacific Feast: A Cook’s Guide to West Coast Foraging and Cuisine. Foraging is looking to be the next big foodie trend, so stop by to pick up a copy. 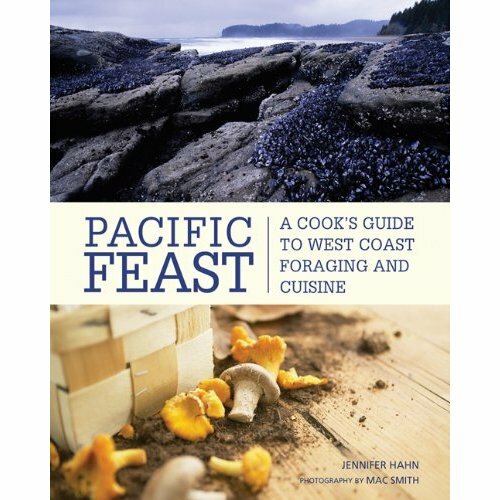 We will also have the supplemental material to the book available – The Pacific Coast Foraging Guide, which is a pocket-reference guide for quick identification of wild foods. 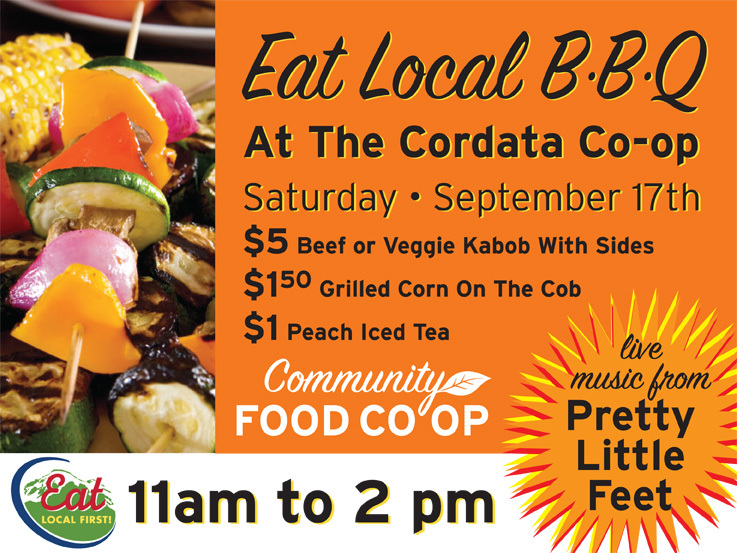 So stop by the Cordata Co-op tomorrow – not only will it be educational, but it will be local-icious as well! I love talking food with my friend Michael M. at the Co-op – he is also an avid cook and is really good about making all kinds of things from scratch, including his own tortillas and refried beans (which I will be trying myself very soon). Late last week he was telling me about how he makes Agua Fresca – a refreshing drink that is common in Mexico and Central America. It is essentially a fruit, grain, and/or flower flavored beverage that is great on a hot (or warm, in our case) summer day. 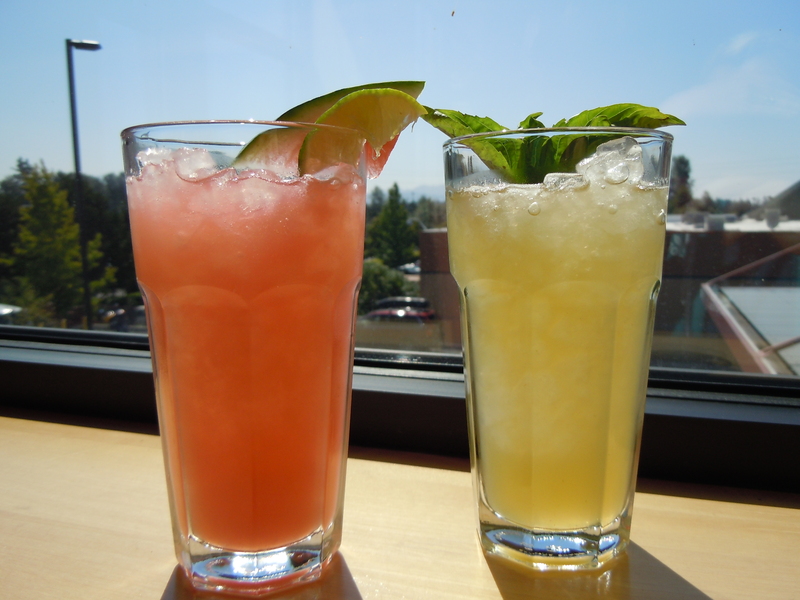 The forecast predicted warmer temperatures and sunny skies for this weekend, and I thought that Agua Fresca sounded like a great recipe to demo. We have so much delicious Washington grown fruit right now to choose from that the biggest decision was deciding what flavors to make! 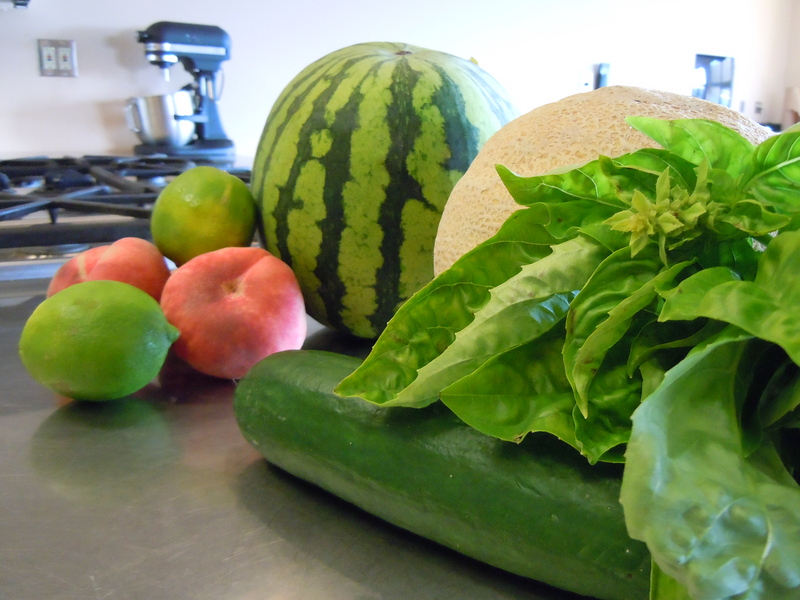 With Michael’s sage advice, I decided on a couple different ones – watermelon, donut (or Saturn) peach and lime for the first and cantaloupe, cucumber, basil and lime for the second – and all ingredients except the lime were grown in-state. 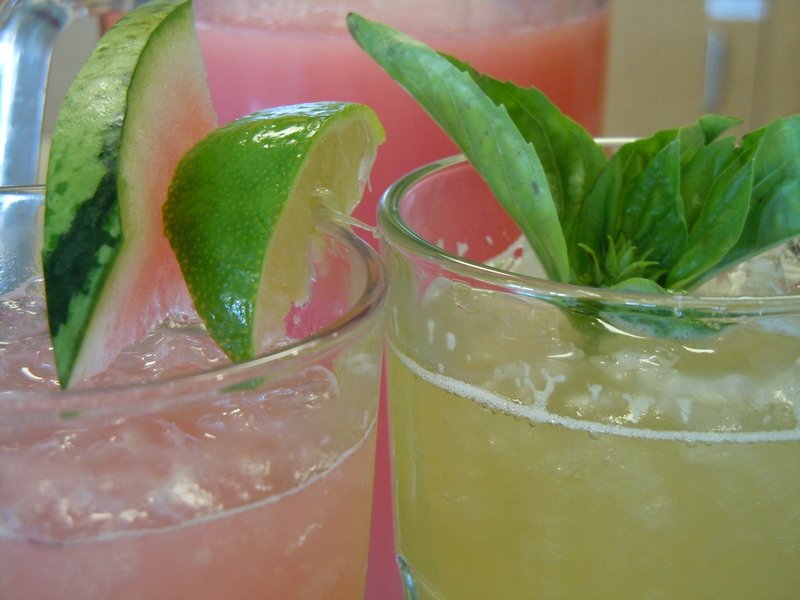 Agua Fresca is extremely easy to make – simply peel and rough cut your chosen ingredients and throw them in the blender. Once they are puréed, you strain it through either cheesecloth or a fine mesh strainer, add it back to the blender with a little sugar, and then into your pitcher with some water. Once it is chilled (very important – it is best when served ice-cold) you are good to go – one sip and you feel like you should be sitting on a beach with a good book – you can almost hear the waves crashing in the background! You can use any soft fruit (or vegetable) for this recipe, and you are only limited by your imagination. This is a great way to use overripe fruit, as it will purée that much easier! I’ve included the recipes for the two versions I made to sample for customers (who loved it – kids especially), but don’t be afraid to think outside the box! Add fruit/herbs/vegetables to blender and purée. Strain purée through cheesecloth or a fine mesh strainer into your pitcher. 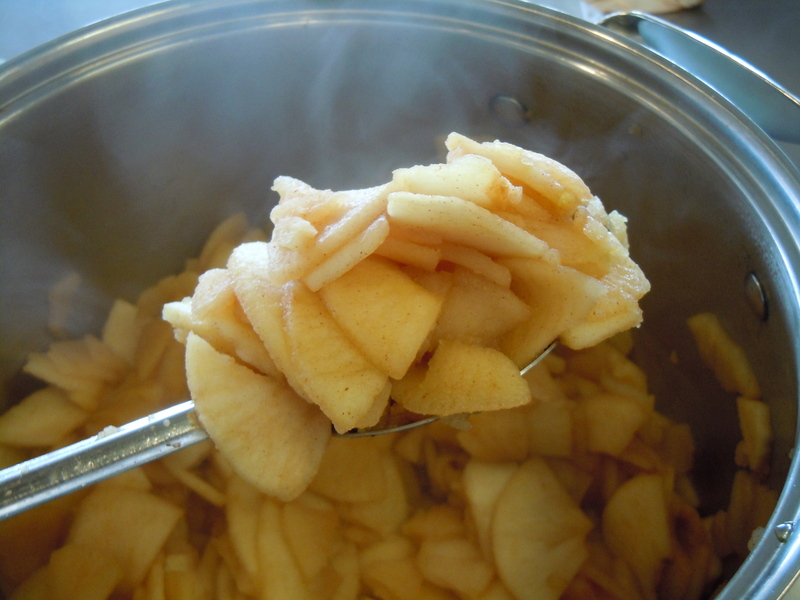 Get as much of the juice from the pulp as possible; discard pulp. Strain again, but back into the blender this time. Add sugar, starting with 2T and blend until combined. Taste mixture to see if you want to add more sugar. Pour mixture back into your pitcher. Add enough water to fill container and mix. Chill completely and serve icy cold, preferably with crushed ice. * you can use just about any sweetener – if you choose to use a liquid one like honey or agave syrup, then you should dissolve it in a little bit of hot water before mixing it into the purée. Can’t you see the beach? Agua Fresca translates literally as “fresh water”. 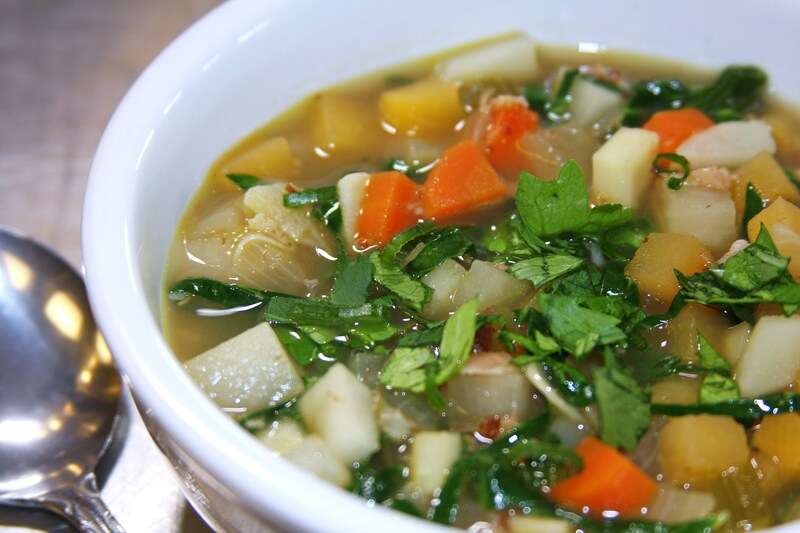 It is served all over Mexico and it very simple to recreate at home. It is hard to mess up—you can add as much water as you like to make it thinner or thicker, depending on your personal tastes. Comer con gusto! In honor of Cinco de Mayo, this week I wanted to prepare a Mexican recipe. 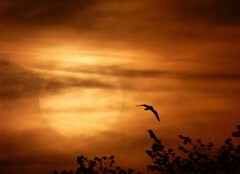 Even though you wouldn’t know it was May by looking outside in Whatcom County, everyone is craving a bit of freshness that this month usually brings – anything that might trick our brains into thinking that we might eventually see two full days of sunshine in a row! 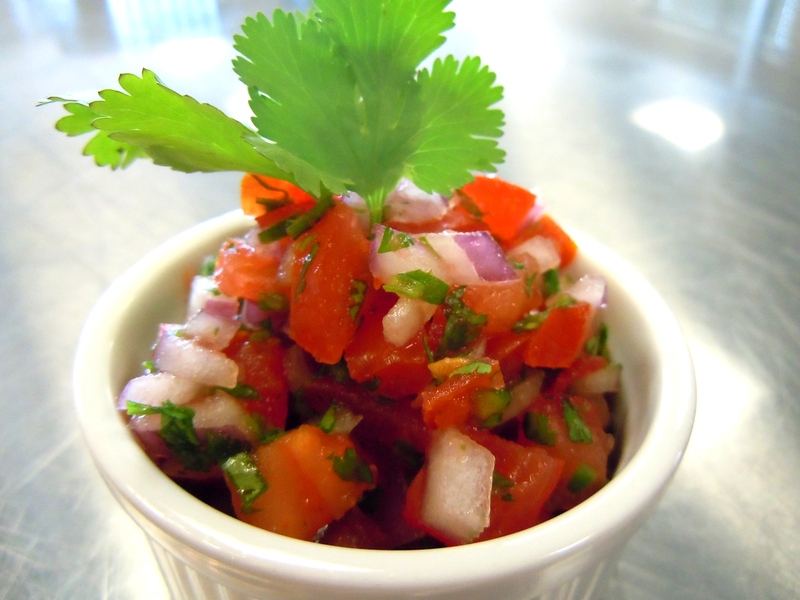 I know that I am already waiting eagerly for more local produce to start arriving, so I chose a recipe that is fresh and tastes like warm weather – Pico do Gallo. Pico de Gallo is a common condiment in Mexico. It is commonly a tomato/onion base but can also be a fruit salad tossed with chili powder (in parts of Mexico where this is common, the tomato/onion version is referred to as salsa picada). It is a dry salsa, so it can be used in many different ways without creating sogginess. 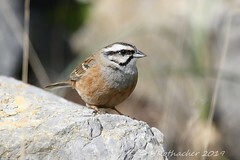 I’ll focus on the tomato version – where it gets its name from is slightly disputed according to Wikipedia, but translated it means “rooster’s beak”, and is thought to be called that because it was “originally eaten with the thumb and forefinger, and retrieving and eating the condiment resembled the actions of a pecking rooster”. While you can certainly eat it that way, you can also use it in tacos, as a chip dip, in fajitas, and even sandwiches. Pico de Gallo is a really pretty condiment – the red from the tomatoes, white from the onion, and green from the jalapeño and cilantro conjure images of the Mexican flag.The lime gives it a sunny citrus-y aroma to complete the palette pleasantry. I used hot-house tomatoes grown in British Columbia and an organic red onion grown in Washington, but a couple of my ingredients fittingly came from Mexico – an organic jalapeño and an organic lime. Round that out with some organic California cilantro and you’ve got sunshine in a bowl! To make this salsa “dry”, you have to seed the tomatoes. This is easily done by cutting the tomato in half and then using a spoon to scoop out the seeds into a bowl, letting the juice run out as well. After preparing my tomatoes, I dry roasted the jalapeño whole in a low-sided skillet over medium-high heat until the seeds started popping, to give it extra flavor. If you have never done this before, it can be a little startling when the seeds pop because the pepper will jump in the pan. Be sure you turn it often when you are cooking it so it doesn’t burn. This should only take a few minutes. Once the skin starts to wrinkle and you don’t hear so many “pops” from the seeds, take it off the heat and tent some foil over it while you cut up the rest of your ingredients. Once I had the lime juice squeezed and the onion and the cilantro diced, I added them to the bowl with my diced tomatoes and added a little salt. When the pepper was cooled, I cut it in half and seeded it, then chopped that up and into the bowl it went (don’t rinse the pepper to get the seeds out, otherwise it will lose some of the oils you released when it was cooked). It went into the fridge to chill for an hour or so and it was good to go (although this isn’t necessary). Pico de Gallo is best when consumed the day it is made, although you can eat it the next day – keep it in the fridge and drain out any liquid that has accumulated in the bottom of the bowl before serving for the best results. Heat a skillet (cast iron works best) over medium-high heat and toast the whole jalapeño, turning it often until you hear the seeds start to pop and it is slightly wrinkled. Tent jalapeno with foil and allow to cool. Once pepper is cool enough, remove the stem and seeds and finely dice. Mix all ingredients in a bowl, adding jalapeño to taste—the pan roasting will intensify the flavor of the jalapeño, so add about half of it at first and taste it before adding more. Serve with corn chips, tacos, nachos, black beans, fajitas, etc. You can add other ingredients to traditional Pico de Gallo, like minced garlic, minced roasted peppers (either Bell or hot peppers), cucumber, hard fruit like mango, jicama, or radish for a slightly different flavor profile. Last October at the Bellingham Gluten Intolerance Group’s Annual Community Awareness Event at St Luke’s Community Health Center, Seattle-area author Karen Robertson spoke. She stopped by the Co-op’s table, introduced herself, and gave me a copy of her gluten-free granola recipe. When I was looking for a good granola recipe to demo, I remembered I had gotten one from her and contacted her about using it. Karen wrote a gluten-free cookbook filled with great recipes a few years ago that is available for purchase on her blog in a digital format (the books are out of print, but you can still find them on Amazon). 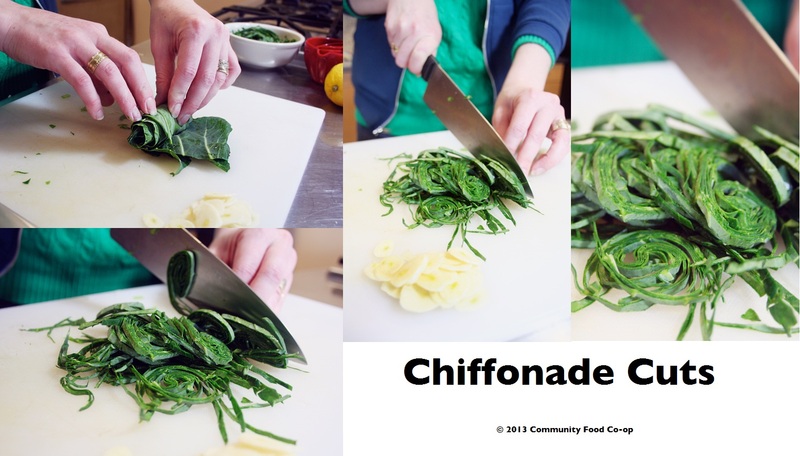 She teaches cooking classes at South Seattle Community College, has taught at Puget Consumers Co-op (PCC), and posts recipes and tips on her blog. 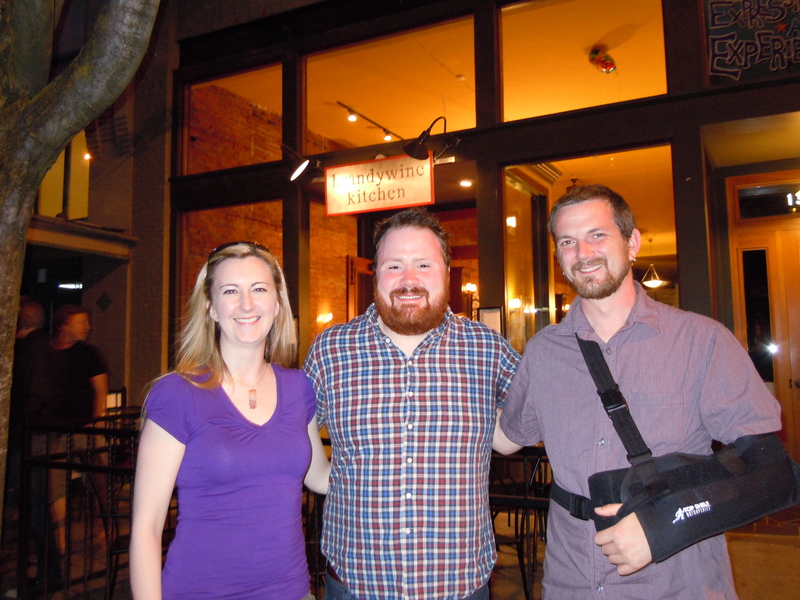 Check it out and support another great local author and cook! Her granola recipe was very simple to make (and smelled divine as it was cooking) – simply mix all your dry ingredients (I used Bob’s gluten-free rolled oats, unsweetened shredded organic coconut, chopped organic almonds and walnuts, and organic cinnamon – you can also add ground flax seeds) and heat up the wet ingredients in a small saucepan (organic canola oil, local raspberry honey, and organic vanilla extract). Mix them together until your dry ingredients are fully moistened, and then spread evenly in a large jelly roll pan or baking sheet with ridges. Cook at a low temp for 1 1/2 hours (stirring every 30 minutes or so) and you are good to go! 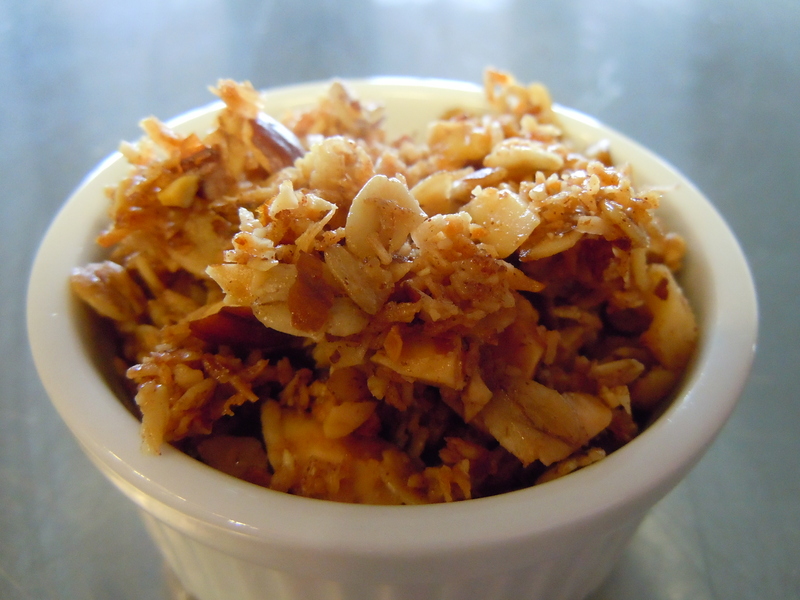 The granola was very popular (one of my most popular demos) and would be very easy to adapt to your specific diet. Not gluten intolerant? Just use regular oats. Don’t like to use canola oil? Substitute with grapeseed oil, hempseed oil, or your favorite cooking oil. Are you vegan? Well, omit the honey and use agave syrup (or brown rice syrup) in its place. A customer said they were going to make the granola and add some diced dried apricot and pineapple to it (after it had cooked) and that sounds yummy. I’m going to make a batch for myself this weekend, and I plan on adding peanut butter to the oil and honey mixture. I served the granola with Fresh Breeze Organic Dairy’s 2% milk (it’s on sale right now) from up the road in Lynden, and Karen recommends eating it with Greek yogurt. Lightly oil a jelly roll pan (12 ½” x 17 ½”) or a large, rimmed baking sheet with a bit of canola oil. Combine coconut, oats, almonds, walnuts and cinnamon in a large bowl. In a small saucepan combine the honey, oil and vanilla. Heat until the honey is as thin as the oil. While mixture is on the heat source, watch it very closely as it can bubble up and boil over. 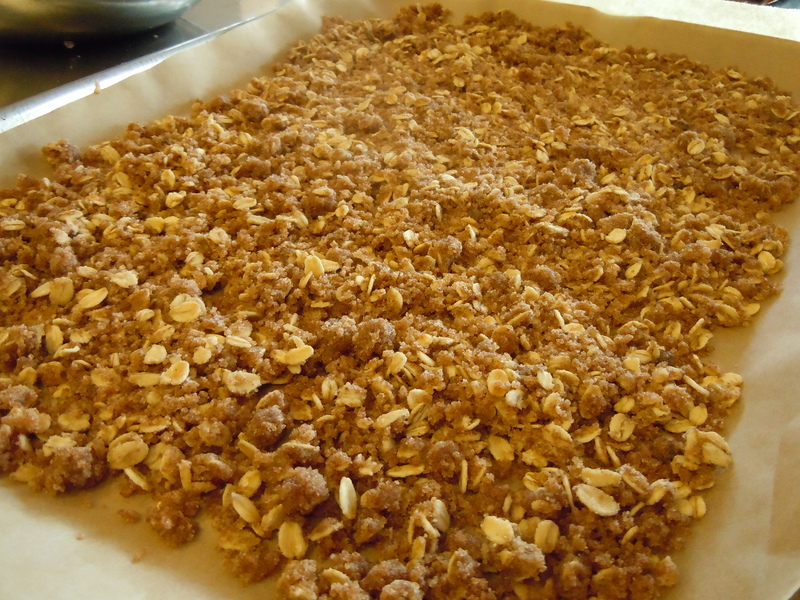 Pour honey mixture over oat/nut mixture and stir until it is mixed evenly and is thoroughly moistened. 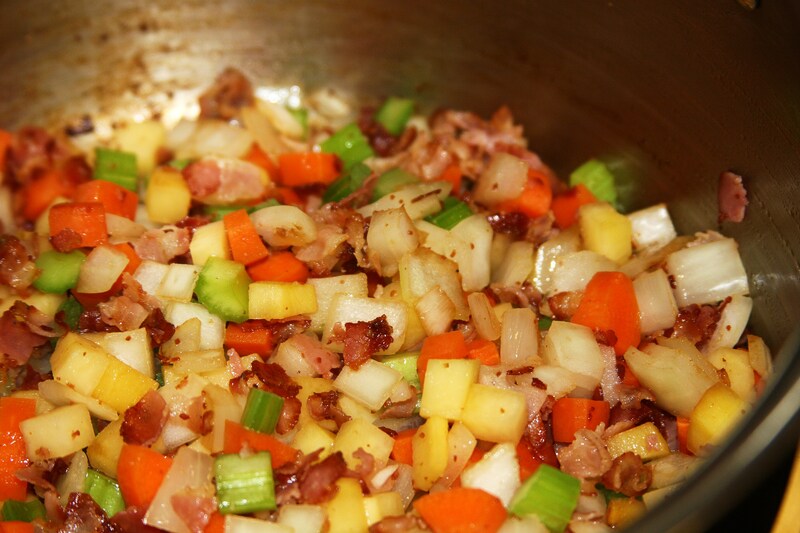 Spread mixture in an even layer on your prepared pan. Bake for 1 ½ hours, stirring every 30 minutes. Black beans (or turtle beans) are tasty and healthy – they are packed with protein and dietary fiber, and are loaded with antioxidants. They are a great choice for diabetics, and could help lower anyone’s risk for cancer and heart attacks. All in all, a lot of goodness is packed into that small package! I ran across an article in last month’s Real Simple magazine about the top foods you should eat, and of course black beans were on the list. 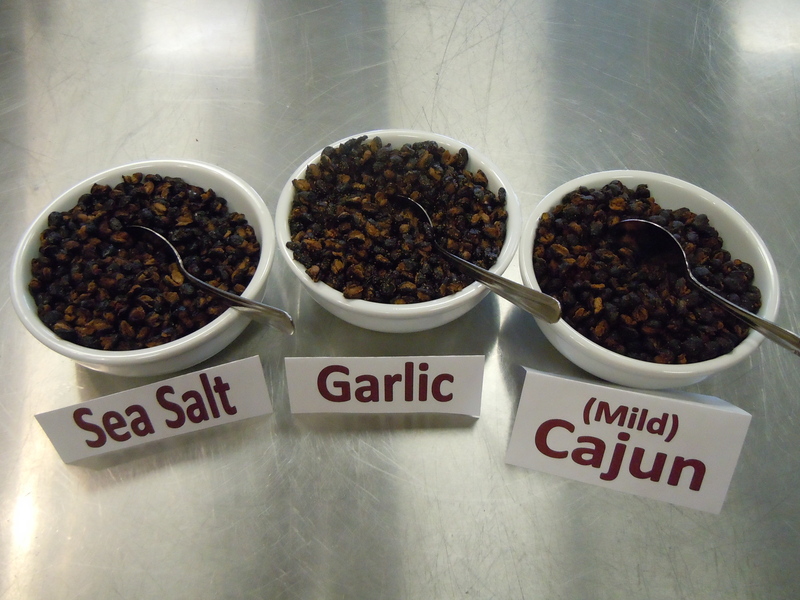 They suggested roasting them in the oven for a crunchy and healthy snack, and I was intrigued – I’ve worked in the natural foods industry for almost 15 years, and I had never heard of anyone preparing beans this way before – I had to try it! 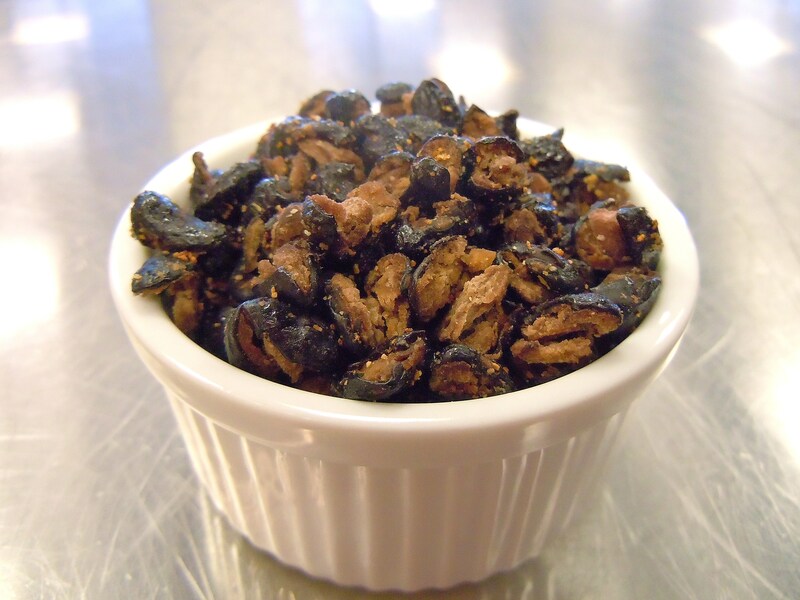 The method is simple – rinse and dry cooked black beans, toss them with some olive oil (a fantastic healthy fat) and your favorite spices, and bake them until they are crispy and dry. Through a little research, I found that they are a popular snack in Korea – you can buy them pre-packaged and seasoned and are popular because they are mild-tasting. If you are looking for big, bold flavors, then this isn’t the snack for you, but if you are looking for a tasty snack that is packed with protein and fiber and is allergen-free (unless you can’t eat legumes!) then look no further. I found that you can make this recipe using any bean, you just may have to adjust the cooking time. I also found that they soak up a ton of spices – I wanted to make a Cajun version, but that didn’t work out quite like I had planned. I added spice to it before cooking, during cooking, and after cooking, and they never exceeded the “mild” rating from tasters, with the exception of the few “surprise” beans that were eye-watering! If you like spicy snacks, then I would recommend blooming the spice in the oil first to try to amp up the heat. To bloom a spice, you would heat the oil and the spice in a pan over medium heat for just a couple of minutes (until it is fragrant). Let the oil cool before adding them to your beans. I will note that I put about a Tablespoon of granulated garlic (I do love the garlic!) over a couple of cans worth of beans, and they were delicious! Everyone who tried them liked them, and quite a few tasters went home with cans of beans (it helps that the Westbrae beans are on sale this month!). You can also use dry beans, just be sure to cook them first! These are also great on salads and in burritos. ~ 1-2 t Spices of choice — Garlic, onion, red pepper flakes, Cajun seasoning, chili powder, sea salt, cumin, etc. Dry cooked beans with a paper towel. Place them in a bowl and drizzle olive oil over them. Add desired spices to taste. Toss beans with oil and spice(s). 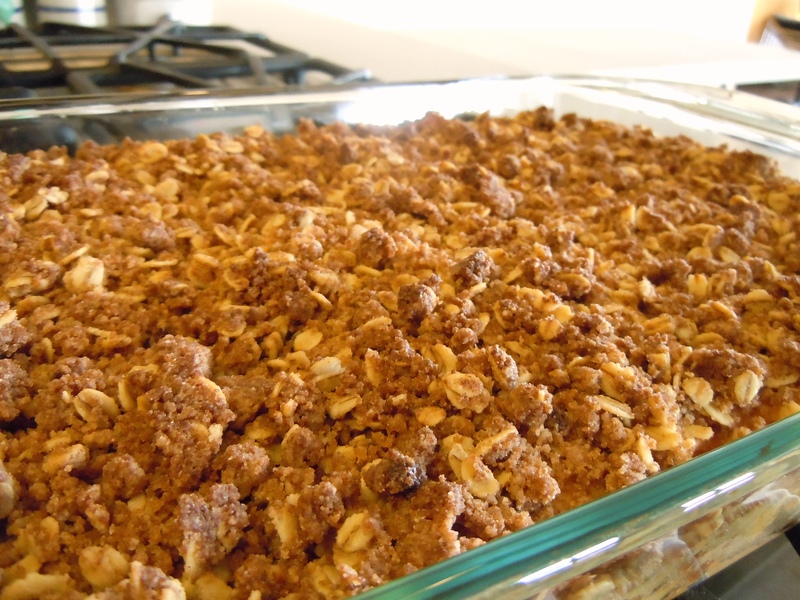 Spread in an even layer on a parchment-lined baking sheet. Bake for 15-20 minutes. Take out baking sheet and toss beans. Bake for another 15-20 minutes, until beans are crispy. Store in an air-tight container for a few days. This mild-flavored snack is a favorite in Korea, and you can also use it to top salads, etc. Use your imagination! You can use almost any bean in this recipe — they don’t have to be black beans! Garbanzos, or chickpeas, are the only ones that could be a little too hard (because of their size) to turn into a crunchy snack, but some enjoy that aspect. Cook for closer to an hour if you give them a try. You will need to use a lot of spices if you want a bolder flavor — be prepared to use more than you think will be necessary! Blooming the hotter spices in oil first will help achieve a stronger flavor. To bloom the spices, add them to the oil and cook over low heat for a couple of minutes. Let oil cool before mixing it with the beans.